I am thrilled to introduce our new Pastor of Faith Formation, the Rev. Jim Peich. As you can tell from his bio below, he has a warm history with our congregation and community. Additionally, Jim brings many gifts and talents to this important position. He is as excited to begin his ministry with us as we are to welcome him! Jim will begin his work on September 30. Continue to hold him and his family in your love and prayers during this time of transition. Pastor Jim Peich (pronounced “pike”) grew up in southern Wisconsin and graduated from the University of Wisconsin – Whitewater. After moving to Missouri in early 2000 to work at Edward Jones, Jim met and fell in love with Karen. The two were married at Manchester UMC in the fall of 2004. Jim and Karen spent six years as active members of the MUMC faith community, where they served in a variety of roles including Staff Parish Relations, VBS, Grief Share, Marketing Team, Vision Council, Christian Leadership College, etc. After struggling with infertility, Jim and Karen were blessed in 2007 with the birth of their son, Christian Peich. The couple enjoyed 12 precious weeks with Christian before he passed at St. Louis Children’s Hospital due to medical complications. It was during this difficult season of life that Jim and Karen experienced amazing love and support from family, friends and the people of Manchester UMC. It was this support and compassion that helped them begin the long journey toward healing and drew them even closer to Jesus Christ and his redeeming love. In 2008 and 2009, God grew the Peich family through the adoption of Lucas (now 8) and Samantha (now 7). After relocating to O’Fallon, Missouri, Jim and Karen became active members of Morning Star UMC. In 2012, Jim answered God’s call to vocational ministry and enrolled in the Master of Divinity program at Asbury Theological Seminary. In 2013, Jim joined the staff of Morning Star and was appointed to be their Pastor of Faith Formation. In that capacity, Jim served on the Executive Team with oversight responsibility for children, youth, connections, baptism, membership, groups, discipleship, technology and more. Before moving into vocational ministry, Jim worked 13 years in marketing and banking at Edward Jones. During that time, Jim also had the honor of representing Ward 3 as an elected Alderman in the City of Manchester. 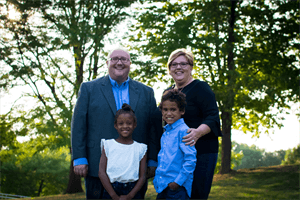 In addition, Jim has served in a variety of a roles within the Missouri Conference of The United Methodist Church, including the Communications Commission and District Mission Council. He has also been a presenter at Annual Conference, Compass Workshops, Candidacy Summits and other conference meetings. In addition to spending time with his family and their chocolate lab, Peyton, Jim enjoys traveling, nature, music, grilling and antiquing. Karen is a Sr. Recruiter with Charter Spectrum and enjoys swimming, cooking, reading and antiquing. Their son, Lucas, loves to fish, swim and ride his bike. Their daughter, Samantha, enjoys swimming, dancing and gymnastics.